It might be possible to harness the movement associated with the ocean’s natural waves using docked fishing vessels. Researchers are demonstrating this simple idea is feasible using a demonstration vessel currently docked offshore in Western Norway. Transforming a vessel into a wave power plant requires installing four large chambers, in the vessel’s bow, each equipped with an air-powered turbine. As the waves strike the vessel, the water levels in the chambers rise leading to an increase in air pressure, which consequently drives the four turbines. The chambers respond to different wave heights, allowing greater wave heights to contribute more air pressure. Each turbine is capable of produced 50kW. Using mathematical models and simulations, the researchers expect the plant to produce 320,000 kW per year. Though the concept seems simple, producing the technology to carry out the project was no small feat. The structures installed on board required advanced engineering to ensure none of the moving parts were in direct contact with salt water. Engineer and Project Manager Edgar Kvernevik explains that electricity is produced with the help of a fluctuating water column, a concept that has been demonstrated to be a trusted approach. The vessel can be left to swing its anchor in any part of the ocean with sufficient wave energy. A special anchoring system aligns the anchor so that the vessel always faces incoming waves to optimize efficiency. What is even better is that this can all be controlled remotely from onshore. Currently tests are being conducting in an area of Norway where the high annual average wind speed provides a well-suited region for the exploitation of renewable energy from wind and waves. However development will not stop here. Once electricity generation is ensured, hydrogen production plants will be installed on the vessel so electricity can be stored in the form of hydrogen gas. Capacity can also be enlarged to 1MW by installing modules on larger vessels. Finally to take advantage of both wind and wave energy, platforms have been designed to carry a 4MW wave power plant with a 6MW wind turbine installed on top. SINTEF. 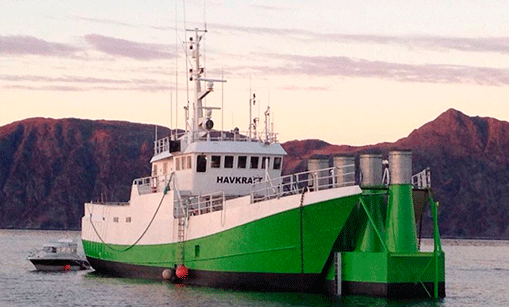 “Fishing vessel transformed into a wave power plant.” ScienceDaily. ScienceDaily, 9 February 2015. . This entry was posted in Niti Nagar, Wave Power and tagged renewable energy, SINTEF, Turbines, Vessel, Wave Energy, Wind energy by Emil Morhardt. Bookmark the permalink.